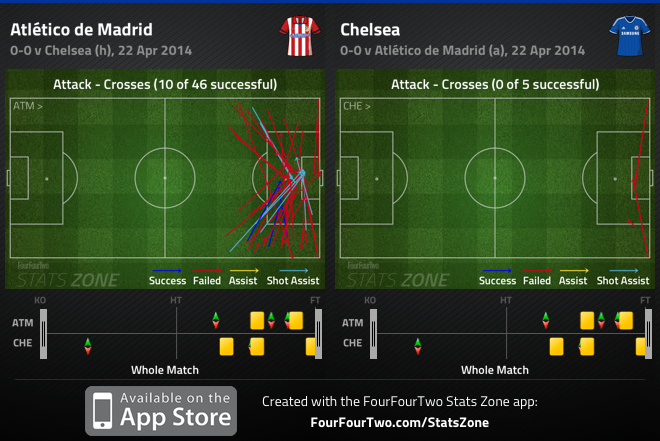 Atletico Madrid and Chelsea played out a very cautious first leg. Arda Turan was only fit enough for the bench, while Diego Simeone chose Diego rather than David Villa as Diego Costa’s partner. Jose Mourinho selected a defensive-minded 4-1-4-1 system. Branislav Ivanovic was suspended, so Cesar Azpilicueta switched flanks and Ashley Cole made a rare start at left-back. Chelsea’s defensive approach was obvious from the outset, and Atletico dominated possession. There were few genuinely interesting features of the game and no real progression to the tactical battle. A meeting between two counter-attacking sides is rarely pretty, especially when neither side considers themselves genuine favourites, and in a two-legged contest with a great deal riding on the game. Mourinho decided, naturally, that the optimum approach against an Atletico side that loves sitting back, winning the ball in midfield and counter-attacking rapidly was to defend extremely deep, preventing the home side from attacking in their preferred manner. That was fair enough, but the disappointment was that Chelsea couldn’t have been slightly more proactive with their method of winning possession. Chelsea have shown in the past, for example in the thrashing of Arsenal, that they can play the Atletico way, and press quickly in midfield to expose the opposition backline quickly. A clash between the two sides playing that way would have been fantastic for the neutral – fast-paced and action-packed. There’s quite a difference between that form of counter-attacking, and this form of counter-attacking, which is really just defending, and the majority of the game was simply Atletico playing in front of Chelsea. Perhaps it was best summed up by the fact there were no bookings until the 64th minute, despite these being two physical, feisty teams – there were never any situations where Chelsea were brought up the pitch and tempted into tackles. Anyway, Chelsea played deep – partly because (unlike in that game against Arsenal, for example) the opposition striker has great pace, and thrives on bursting into the channels. With Chelsea sitting deep and the full-backs tucking in, Diego Costa didn’t influence this game much, and while clearly a big physical presence, he wasn’t able to get the better of Chelsea’s centre-backs when battling in the air. This is quite interesting in the contest of Costa’s international career – since he switched to Spain, he’s been widely regarded as the obvious solution to their problems upfront. But Spain regularly face parked buses, something Costa struggled against on his international debut, as well as this evening. Costa is a brilliant counter-attacking striker, but “only” a very good penalty box striker. He’s probably still Vicente del Bosque’s best bet, but the stylistic issue shouldn’t be ignored. Atletico seemed unable to create anything through the centre, with Diego dropping deep in advance of John Obi Mikel to collect the ball, but often finding himself in a congested zone featuring three Chelsea central midfielders. Instead, Atletico had to go wide. Filipe Luis was practically man-marked by Ramires, while Willian did something similar on Juanfran, but Atletico sometimes created 3 v 2 situations with Gabi moving to the right, and sent in a stream of crosses throughout the game. Inevitably a key aerial target was Raul Garcia, who proved crucial in the air during Atletico’s previous round, the victory over Barcelona. He towered over Cole but rarely provided decisive moments in the air – although he had at least four headed efforts over the course of the game, often when arriving at the back post, with Azpilicueta also not the tallest on the opposite flank. There was a lack of variety to Atletico’s play, though. They didn’t switch play quickly, so Chelsea always seemed very sure of themselves positionally, and they didn’t attempt to penetrate through the centre to bring John Terry and Gary Cahill up the pitch – it was just a training session of crossing for long periods. Chelsea relied on set-pieces for their attacking moments. It’s difficult to understand why David Luiz is repeatedly allowed to take free-kicks in good positions – a couple of excellent free-kicks shouldn’t hide the fact he constantly wastes good situations. Willian and Ramires combined nicely on the break in the first half – they were the only two players breaking forward from deep positions – but the latter produced a strange cross-shot that drifted harmlessly past the far post. Fernando Torres was amazingly isolated throughout. Some of his movement wasn’t very good, often drifting towards the ball and into crowded situations rather than making forward runs into the channels – maybe an acknowledgement that he lacks pace these days. He played better in the second half, however, battling against centre-backs manfully on his old stomping ground, but never truly offering a goal threat. In truth, this wasn’t a particularly interesting game. Defensive, cautious matches can be interesting in a tactical sense – in fact, they can be amongst the most tactical games you see – but they generally need either side to do something particularly interesting, or for there to be one obvious key zone, or for the sides to be completely contrasting in one respect. This was just a defensive game throughout, with no progression. haha love that “real” formation diagram with A.M camped in the Chelsea half. i guess many will have seen the CardenaSer pic of chelsea’s 9-0-1 formation at times too. credit Mou though, as boring as it was, if you can guarantee the clean sheet, it does build a sense of belief, although as some ppl have pointed out, such as Guillem B, is 0-0 and no away goals really such a great result. a real shame fixture congestion is threatening to spoil the liv v chels game. injuries to key city players took the edge off the big city v chels lge battle at the etihad. so the much anticipated attack v defence.. unstoppable force v immovable object battle didn’t really happen full-on. Liv now have a similar attacking/goal scoring form but again it might go ahead in another not so full-on manner. You probably shouldn’t adhere to any tactical insight from Guillem Balague. In fact, don’t even pay attention to that hack. interesting comments re Costa and packed defenses. Everyone seems convinced that he’ll be at Chelsea next season, but that’s Chelsea’s biggest problem, they’re v poor at opening up solid defenses. Seems an odd choice. Great point. Chelsea have lost the league because of the former (they’re the best team against the top sides, but have simply been unable to beat park-the-bus teams) but gone furthest of the English teams in the CL because of the latter. What to do about the striker remains a huge conundrum. It’s as if they’ve got into a position where they can’t imagine playing with any other type of striker to Drogba – but then he was more or less unique! Although it still begs the question of why Lukaku wasn’t kept on. I actually think a grafter like Llorente, who wouldn’t be expected to score 35 goals a season but would contribute both goals and to the build up, might be the best option. great comment on Lukaku! So Costa should be top priority for chelsea, or even Falcao if he is on market. What do you think? Chelsea controlled the game for 90 minutes. Packed central midfield and pressed Atl.madrid to the wings where they didn’t mind letting them cross the ball since the Chelsea advantage in the air with players such as Cahill, Terry, Mikel and David Luiz. Luiz also played man-man VS Costa during set pieces. What could Atl.Madrid do? The could involve their centre-backs Miranda and Godin who rarely touched the ball and that way play Suarez/Gabi higher and in that way even might get an aerial improvement. Or they could go deep and force Chelsea to play with the ball. Or they could simply just shoot a lot more from distance considering the low and compact Chelsea team wich would probably result in better chances than the constant crossing. It was really interesting to see that the Chelsea midfield 2 in front of the pivot did not defend against Gabi or Suarez when they advanced past half way, but were tracking back and more ready to mark the narrow wingers. The back 4 of Chelsea always stayed and when the 2 Athletico strikers went deep, the Chelsea fullbacks followed and the pivot dropped back into the defensive line to always keep a back 4. If the narrow wingers came inside, they were always marked by the 3 loose men in central midfield and the other two chelsea central players completing a line of 4 in midfield. When Athletico got to the opposition penalty box and Costa and Garcia were in the box, the Chelsea Pivot joined the defensive line to make a back 5. Chelsea pinpointed the attacking weakness of Athletico as the 2 central midfielders and almost allowed them to shoot from long range. You could say that the central defenders of Chelsea were always left free when the fullbacks marked the attacking 2, to concentrate on the aerial balls. Athletico always defend with a deep 4-4-2 block but it was interesting to see that even in attack, Chelsea always marked Costa and Garcia with the midfield pivots, leaving the centre backs free. Chelsea didn’t mind being outnumbered in midfield and almost let Gabi and Suarez have the ball. There was always space in the central midfield zone for Athletico. To counter this, Athletico tried to play quick diagonal balls to the left wing and overload with Koke running in behind. But he was always marked by the right shuttler of Chelsea. In the second half, the huge space in the central midfield zone was occupied by Koke and Diego/Turan, but the chelsea shuttlers then pushed up to mark them. Athletico also pushed the fullbacks very high up and always played a 2-2-2-4 formation, trying to get Chelsea to play one-on-one at the back. But the Chelsea wingers always tracked back. Athletico were also cautious and never really had a box to box number 8 breaking the lines and kept the double pivots deep. There was the one great moment where Azpilicueta bombed forward andnlost the ball. It looked like Jose wanted to strangle him as he furiously waved him back to his defensive positioning. I think it forced Cahill to slide out and tackle the ball out of bounds when Atletí tried to exploit the place Azpilicueta had vacated. That was the only real time that hinted at what a all out back and forth would look like. Chelsea were either unwilling to attack on the break, or hampered by Torres. They never seemed to use to legs of Ramires and Willian and should have threatened more. There didn’t seem to be any obvious pattern to their “counter-attacking”, with some sharp movement and an incisive first pass they could surely have threatened the Atleti goal more in this game. As for the second leg, Atletico are favourites for me. Like the PSG game the onus will be on Chelsea to attack. Are you telling me that Atleti aren’t capable of eking out a 1-1 draw away from home? Dream scenario for them. And to think, Ray Wilkins said Chelsea were his favourites because they were the only team left capable of keeping a clean sheet! Atleti are the best organised side in Europe. Chelsea obviously didn’t have intentions to go on the break. They basically defended to no concede a goal rather than winning the ball. If they had intentions of playing on the break while playing that deep they’d play with pacy wingers or an attacker capable of holding the ball rather than himself going on the break. If they had intentions of actually revolving around counter attacking a player like Schürrle would play from the beginning to actually get to the open space caused on Atl.Madrid’s half. Can’t wait for the next game, I know Mourinho has something up his sleeve. He’s the king of the cup format and revolving around separate games. Simeone won’t win if he doesn’t do something different, Chelsea has obviously done their scouting. I’ve seen Simeone playing deep once this season, that might be an approach for the next game. Klopp? Klopp isn’t capable of forming zonal defense and his defensive third is one of the worse in top football. If you know how cup matches work with the revolving around delivering result over two separate games you wouldn’t say a word. It’s pretty much a completely different game comparing league games. Nothing wrong with revoling around counter attacking. Both Klopp and Simeone does the same and rarely win games with high possesion since they’re incapable of breaking low defending lines. The only difference is that they try to counter attack from the opposition half and therefore don’t have to build with pace to get to the area created by playing low. You don’t understand how complex it is. It’s a tactical approach just as any other tactical disposition and if you don’t like it you don’t love the game and therefore I wonder, what are you doing here? 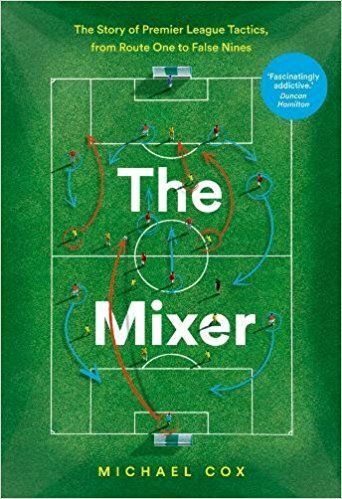 By playing deep you create an enormous pocket of space to counter on the opposition half, that’s even more attacking space created than playing with a high pressure line. Of course, we dont understand how complex it is if you play counterattacks and park the bus. And that is the reason why any team no matter how good is can beat any team with parking thebus . But the opposite does not aplly. Worse team will never beat better team by an attacking football. I also do not understand this. Mourinho seems to pride himself on his tactical awareness but he seems content to let Luiz blaze freekicks over the bar. Maybe he’s done some great ones in training? He’s scored some good ones last season in competitive matches. I can understand giving him a 30 yard chance to hit one (he did score a great one in the EL last year), but the one he missed to the right of the area I think would have been better for a Willian or Lampard who might have done something with more finesse. On another note, it seems the really good free-kick takers are not around anymore. I heard somebody say that Yaya Toure is the best around at this right now, but he just kind of takes ’shots’ from a dead ball, rather than have a specific technique for set pieces. Pretty sure Pirlo would have something to say about that. And heck, Del Piero is still stroking them in every other week, even if it is in the A-League. But yes, Luiz as a free kick taker is terrible. When I saw him line up that one on the right of the area last night, I said to my mates, “Into the wall”. And he delivered. Goalkeepers must feel relived when he steps up to a free kick. FIFA should ban Mourinho and his anti-football from all competitions, he gives football a bad name (and image). I’m not sure that would look like a strong argument on a ban order though. Maybe if the judge was a Barcelona supporter, it might go through. there’s public footage-evidence to prove that He is trying to kill all the beauty of this sport. I think the beauty of football is the varying styles of play teams can choose to adopt and how there are countless ways of winning. 2 legs is just that: 2 legs. Drawing the 1st leg with no away goals cannot be a bad result. There is something commendable in having a design and executing that to perfection. There is a beauty in defensive organisation. I guess you and I are two of few that actually love the game. People like ‘Johnny’ here obviously don’t love the game. The game is constantly compared with chess for an obvious reason, it’s the most complex chess game and if you don’t even like chess I can’t really see how you’d love football. This game was one of the most beautiful and interesting games so far in 2014. Went pretty much as expected. Now of course Atletico will sit back at Chelsea, and Mourinho will not dare be adventurous. He’ll probably be happy with penalty kicks, as he figures that psychologically, the Atletico players will be more anxious since they see this as their year and perhaps their only opportunity to ever win the tournament. Simeone however is no slouch in football psychology. He’s got to emphasize to his squad that they are the underdogs and that they should be ecstatic if they can get to penalty kicks. Ah, what honour and what entertainment, huh?! That’s why I prefer to watch Barca, win or lose. Mourinho’s teams have typically been abysmal in shootouts. I can’t remember the last time one of his teams went through after getting that far. I’d actually favor Atletico in that scenario. That being said, I think Chelsea will have to be more proactive in the second leg because Atletico will sit deep and try to invite pressure. Because of Chelsea’s lack of defensive midfield options, they’ll have to put more attack minded players on the pitch who wouldn’t benefit from sitting deep against Atleti. There is no way Penalty shootout would be desirable for Chelsea. Petr Cech is out for the season and Atletico has Courtois, maybe the best shot stopper out there at this moment… Jose has to win this clean in 90 min (+ET) … !! Maybe, but sometimes great ‘keepers aren’t the best at penalties (Buffon, Casillas and Cech are all OK at penalties). I’ve never seen Courtois in a shootout but with his confidence I wouldn’t be surprised if he’s good at them. i think the game was very much assessed by simeone’s comment .he said that his side tried to open chelsea through the middle and through the wings with crosses . i think his comments and the way his side played was very important . he tried to change the approach when saw that the things were not bearing fruits in one direction . this is important because of the recent sacking of moyes . you should had done the everton-utd game and then the difference in the approach and the changes in it would had made evident . man utd couldnt change their approach that day . you could see the way athletico changed their approach in the game . i think the game showed the tactical awareness of simeone against mouriniho . who in tactical approach rarely gets wrong . i think that chelsea oscar more than hazard . you described the formation as 4-1-4-1 . i thought it was more of 4-3-3 or 4-5-1 . why i say that chelsea missed oscar because he would had played in behind torres or in place of lampard or mikel . he is much more mobile and with him chelsea would had kept the ball better and would had better offense . i think in the second leg he would be the difference maker . Chelsea and Mourinho are a disgrace for football, every win for them is a defeat for football. Don’t get me wrong, i can appreciate a good defensive team that gets out quickly on counter attacks but Chelsea showed total lack of willing to play football and in their case it isn’t a must to play this way they got enough quality in their squad to play football. I know this is more of a rant than a tactical analyse but i had to get it of my chest. A common view but don’t forget that Chelsea have beaten Man City 2-1 and 1-0, Arsenal 6-0, Spurs 4-0, Man Utd 3-1 and Liverpool 2-1 this season in the premier league. Add to that two 3-0 wins against Schalke, and two 2-0s against Gala and PSG in the champions leage. Seriously, get off your moral high horse. While any idiot can instruct the team to sit with 10 men behind the ball, it was a smart ploy as it completely neutralized Atletico’s strength there was totally no space behind the defence for their players to attack which is what they do best. What he did well though (as he always do) is to drill the team to defensive perfection. Diego Costa was in Cahill and Terry’s pocket all night long and Koke could only send in hopeful cross after cross. It was obvious that Atletico looked fairly clueless when they actually have the majority of the possession. It’s not really strange there is no room because there were 10 chelsea players in the box all the time. What frustrates me is that they didn’t even want to counter attack, just kick the ball upfront and if it by any chance goes to Torres let him wonder what to do with it but the rest had to stay in the box. Most funny thing was the chelsea supporters celebrating the 0-0 draw. I can’t figure that out, you pay a lot of money to go to spain and watch your team and they refuse to play football, if you like football you shouldn’t celebrate such performances. I don’t usually watch chelsea because i like football and teams managed by mourinho don’t really play football. And of course they must have been playing better games to watch than the one against atletico but i was talking about this game and the way they played disgusted me. Just because you’re a fan doesn’t mean you have to put up with everything. I’m from the Netherlands and i was ashamed the way we played at the WC2010. Yes we reached the final but destroyed everything the beautiful Dutch game was once praised for and now all that is left is a mediocre team. I pay to watch my team work hard and get a good result. Chelsea did both. If the style is not to your liking, it’s understandable. But don’t be so arrogant as to assume it’s the same for everyone. There’s no right or wrong way to play football. And don’t compare us to the 2010 dutch team, we’re defensive but not violent. You know what the problem is? You don’t love football. You like a certain style of play, that’s not a love for the game and therefore your oppinion doens’t matter at all. Obviously you don’t understand the complexity of the game. This was one of the most beautiful and interesting games of 2014 stimulating every tactical nerve in the football loving body. If something, you’re a disgrace to the game. People who have no love for the game has no value in the world of football. It’s our world. Lol no love for the game, are you kidding me? There’s nothing tactical in parking the bus if you don’t have a plan to exploit the space behind the opponents defense. The way Real parked the bus against Bayern that was tactical and i can appreciate that. Yes i prefer attacking football way more but i can appreciate defensive football as long as they have a plan and not just that they defend for the sake of defending. One of the most funniest thing is that your tactical idol mourinho went totally crazy when west ham played this way, he called it 19th century football which wasn’t up to premier league standards. So basically you’re saying mourinho has no love for the game. The winning team is always the better team. Winning is beautiful no matter what your approach is, every tactical disposition leading to winning is the true beauty of the game and if you don’t understand it you don’t obviously don’t love the game. As long as you’re not cheating to victory. In your opinion were Chelsea better than Bayern in the 2012 final, if you look at actual the chances that were created and not taken ? Bayern may have created more chances, but how many of those chances did they squander? Goal scoring chances are meaningless if the team isn’t clinical. Statistically, Chelsea were more clinical with their chances than Bayern. It’s all moot, in retrospect, as the game was decided by penalties. This game eerily reminded me of the Manchester United-Fulham game. Atletico just kept on crossing and Terry and Cahill headed the ball away without much trouble. That being said, Atletico had more chances when Terry limped off but Raul Garcia was particularly wasteful. 2nd leg will probably be a reversal of this game. 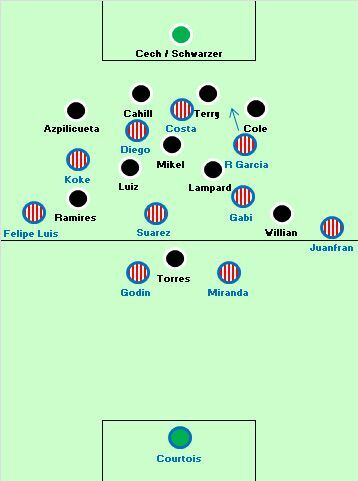 Atletico sitting deep and Chelsea looking to probe but ultimately not finding a way through Miranda or Godin. You’d've thought Atletico would’ve given up on the aerial crosses when they saw how delighted Terry and Cahill were to head them away. Hardly ever tried to cut the ball back along the ground. Simeone needs to have a good plan for the return as I make Chelsea heavy favourites to take the tie. Nothing of his plan for this game either worked or was likely to work. So far everything has gone the way Mourinho would’ve wanted as it so often does in knock-out. Great analysis. Your point about Costa was spot on. He was poor against Italy. …good result for Athletico … second leg will be 1:1 – or even 0:1 – and Chelsea is out. After this game I think they should really change the 2 match format to something more attractive. First time I fall asleep while watching football for a long time now. I think I did so when watching Ferguson’s Man UTD in UCL few seasons back. Today for instance Real did play defensively against Bayern, but their play style was somehow attractive and their counter-attacks a joy to watch. Its such a shame to watch in the Champions League, where true champions are supposed to be playing and to respresent the beauty of this game to show such a play. And it is not like Inter and Chelsea did not win in a similar way the competition recently. Not a Barca fan here. Honestly, what could a coach do in this game? Tactically I have no clue how can you break a 9-0-1 system where all the channels are pre occupied with good defensive players. Imagine a future where all the football matches were like this one. Ugly, ugly and boring football. And imagine a future where both teams attack, with a flurry of chances at both ends. That’s why I will always cheer the attacking team and hope more and more teams successfully play this way. In EPL I used to be a Man Utd fan (the team with CR, Tevez and Rooney), then Arsenal (with RVP, Cesc Fabregas, Samir Nasri), now I root (for a couple of years actually, since Suarez arrival) for Liverpool. I don’t see anything attractive at playing defensively, just team work, no skill, no imagination. This is the easiest way of playing this beautiful game, sitting deep and hoping to score a lucky goal. It implies nothing more than hard work, team cohesiveness and bullying the opponents. So please give me a break with the comments regarding the beautiful game played by Chelsea last night (do you remember the CL final between Milan and Juventus? Brr…). And one last thing: when you have such an expensive team (or such a big transfer budget) you are somehow required to do more than just defending… Just my 2 cents. The problem, which many here don t understand, is that reactive football is the only and easier way to win against stronger possession bases sides. If Chelsea, Atleti or Real would really try to “outplay” Barcelona or Bayern, they would be destroyed. Defending and reacting is always easier because on the break you have plenty of space, which a team that faces the “block” never has. Atleti seemed really impotent which such forced possession. Although they have “physis” and a “true 9″ which Barcelona lacks. What I don t understand is why Jose was content with 0:0 because he needs to win now and Atleti are favoured again when they re able to counter on Tuesday. I hope they win cause i can t stand that ugly arrogant Mou guy. Although Atleti are a reactive side, I hope they ll win the CL this year, because they are something like an underdog and more sympathic then Chelsea, Real or Bayern. ZM why did you even take the time to do this game..frankly if all football matches were under maurinho the whole world would stop watching this game in 5 years. chelsea is rubbish..the football they play – crap, the manager – a total nonsense. Am i surprised this was what maurinho wanted -NO. could any chelsea or maurinho fans be proud of themselves? I really not sure any of them would dare to shout out loud about this game or his methods, sure he can talk all nonsense, yeah. maurinho – you did a fantastic job tonight, we congratulate you just like he congratulate the referee last week. Do they deserve to lose – No, but they surely don’t deserve to win the CL ever again. 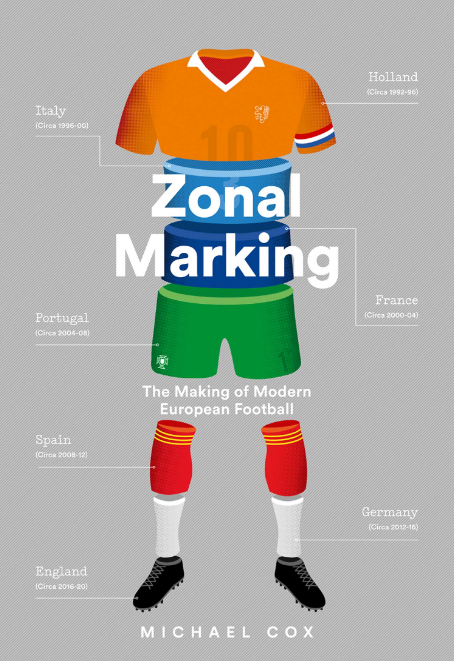 I think its better to do Madrid – Bayern, Benfica- Juve or Manu-Everton – everybody likes to read about that. Or Roma -ACmilan. Or Sevilla -Valencia. or even any Monaco or celtic. Thank you and you still give the best analysis. why no report for Real Bayern match? Omg, almost every moanrinhos big match is here but this not? Where is promised report aboout how managers of big teams play? we got again only report about Chelsea park the bus™ by Moanrinho. The whole word is fed up with Moanrinho only UK likes him. But I am not surprised because I am watch your football sometimes. PL is very poor league. Only Liverpool play a nice attacking football. Others play the mess.